The Fox and the Hound is a 1981 animated feature produced by Walt Disney Productions, first released to movie theatres in the U.S. on July 10, 1981, and re-released on March 25, 1988. It was the last VHS video of the "Classics Collection" in 1994. It was released on "Gold Collection" DVD in 2000. On October 10, 2006, The Fox and the Hound 25th Anniversary Special Edition DVD was released. The twenty-fourth animated feature in the Disney animated features canon, the film is loosely based on the Daniel P. Mannix novel The Fox and the Hound. The film centers around the story of two unlikely friends, a bloodhound and a red fox, who struggle to preserve their friendship. At the time of release it was the most expensive animated film produced to date, costing $12 million. 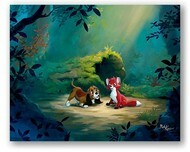 A direct-to-video "midquel," The Fox and the Hound 2, was released on December 12, 2006.